Gareth loves playing outside. In all weather. Knowing that winter was coming, a few weeks ago I purchased a nice, warm winter coat for him. Which he then refused to ever let me try on him. If he so much as saw the coat he ran away screaming. Recently our temperatures have dropped drastically, causing me to pull out my winter coat today. 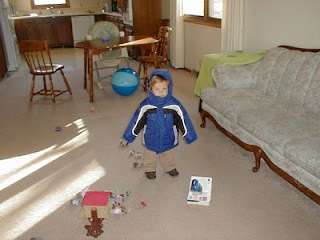 Thinking that Gareth would take more kindly to his coat since it's so cold outside I tried once again to get it on him. With the same writhing and screaming results as previously. However, I finally tricked him into it by putting on his shoes and pointing outside to indicate that he could go out, but only if he put the coat on. Rather reluctantly he allowed me to envelop him in the coat. And outside we went. All bundled up and toasty warm! The only difficulty (and understandable reason for his not enjoying the coat) is that he's so bulky he can't move well. And it makes him more top heavy. Trying to bend over and pick up pebbles or balls results in him falling onto his nose. I guess he can't move his arms well enough in the coat to prevent the fall in time. So now he has a scraped nose and a bruised forehead. But at least he's warm! How fun! If only he could still move... I must say I've never loved winter coats either. Although sweaters are deliciously fun most of the time. Good luck with the winter! Scotty and I are not looking forward to ours. Although I do love looking forward to Thanksgiving (our only break this semester) and Christmas! I don't like big bulky winter coats either because of their bulkiness, though it is nice to stay warm. But that's why I usually wear my nice black coat - because it's not bulky. My bulky one is mostly reserved for shoveling snow these days. I seem to remember that I found a quilted sleeveless vest on sale many years ago for Ryan that he liked. It gave him more arm freedom. However, from what I hear of your weather lately, that would hardly fill the bill. We had a couple of inches of snow, our second of the season. It was much worse in Salt Lake. Overall, our weather is called "leaf drop," about three inches deep so far. If they dry a bit more, I'll get out there tomorrow and try to rake up a few. Mostly I'm in the mood to plant some more pansies.